The contents of eukaryotic cells are organised and moved around by motor proteins running along the tracks that make up the cytoskeleton (microtubules and actin filaments). The largest and most complicated of these motors is cytoplasmic dynein. It is involved with numerous processes, from positioning organelles, to cell division, to clearing up misfolded proteins. Defects in dynein are linked to to developmental disorders and neurodegeneration. Dynein is also used by viruses, such as herpes and rabies, to infect the cell. Our goal is to use structural biology to improve our understanding of dynein’s roles in medically-relevant, cell-biological processes. We used X-ray crystallography to solve structures of dynein’s motor, which explain how it uses ATP to move along microtubules. We took advantage of advances in electron cryo-microscopy to determine a 4Å structure of dynactin, a 23 subunit protein complex that is essential for dynein’s function. Our work showed how dynactin binds dynein and provided the first view of how dynein binds its cargos. Dynein (grey) is a motor protein that moves along microtubules (green). 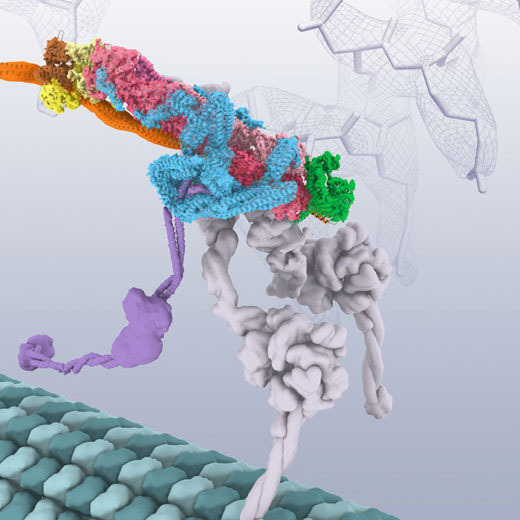 Dynein attaches to its cargo via an adaptor protein called Bicaudal-D2 (orange). The attachment requires the help of another protein complex called dynactin (multi-coloured). We are now interested in the many structural and mechanistic questions that surround dynein. What does the whole dynein look like at an atomic level? How can one dynein complex carry so many different cargos? How is the motor’s transport regulated? To answer these we will combine in vitro reconstitution of transport and single molecule fluorescence motility assays with the latest techniques in structural biology. Cryo-EM Reveals How Human Cytoplasmic Dynein Is Auto-inhibited and Activated. The structure of the dynactin complex and its interaction with dynein. Structure of human cytoplasmic dynein-2 primed for its power stroke. In vitro reconstitution of a highly processive recombinant human dynein complex. Insights into dynein motor domain function from a 3.3-Å crystal structure.